A specially shaped seat cushion to fit the CH24 Wishbone chair. The Wishbone Chair designed by Wegner for industrial production is his most commercially successful design. 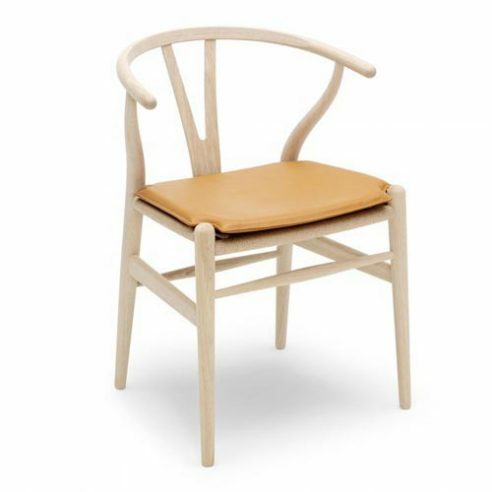 Also known as the Y Chair, the Wishbone Chair has been produced for over sixty years by its original manufacturer, Carl Hansen & Son. lines that would have been more machine-friendly Wegner decided on the free form solution for his Wishbone Chair. Soon after the chair’s birth Wegner decided it should also be produced in colours, and today it is the Wegner chair available in the greatest variety of colours. Wegner himself chose 13 that he found suitable, and in 2010 Carl Hansen & Son decided to produce it in an additional 12 new colours. They have been singled out as being well suited to the light and modern Nordic home.